Sepphoris or Zippori was not a city I had heard of before going to Israel. The remains of this city were first excavated in 1931 and is still ongoing. As you walk around you see an impressive network of streets, porticoes paved with mosaics, public buildings, houses, a theatre, a synagogue from the Roman period, churches from the 4th and 5th centuries and a fortress and a church from the Crusader period. Aqueducts, reservoir, tunnels and cemeteries are also scattered around the ancient city. The city was called Zippori by the Jews, Diocaesarea – the city of the god Zeus and of Caesar – by the Romans, and during the Crusader period it was called Le Saphorie. During the time of Herod the Great Zippori was the capital of Galilee. When the Sanhedrin was exiled from Jerusalem in 70 AD they made their home in Zippori remaining there until the beginning of the 3rd century. It was a city that was built and rebuilt – the result of the city being burned by the Romans, and destroyed by an earthquake. So what you say – an ancient city with no connection to Scripture or Jesus. While Jesus was growing up in Nazareth, Sepphoris (Zippori) was being reconstructed having been burnt by the Romans after a revolt by the Jews; it took decades to complete and it grew to become a city with between 25-30,000 inhabitants. (In Jesus day it was 8-12,000 by comparison Nazareth was a town of 3-400). Sepphoris was sophisticated and cosmopolitan; Jews, Romans, Greeks and Arabs all lived there at one time or another. Just ten minutes walk north of Nazareth you reach the top of a ridge overlooking the Bet Netofa Valley. The hill of Sepphoris can be seen 3 miles north, rising four hundred feet from the valley floor and we were reminded that “A city set on a hill cannot be hid.” Matthew 5:14). The city was only an hour away on foot from Nazareth and while Sepphoris is not recorded in Scripture as a place Jesus visited, he did travel throughout all the cities and towns of Galilee, as well as to Caesarea Philippi and Decapolis. We made our way down a stone-paved street marked with grooves pounded by chariot wheels, passed the remains of homes and shops, and came to the remains of a building, possibly the City Hall. On the floor is a mosaic depicting the Nile. 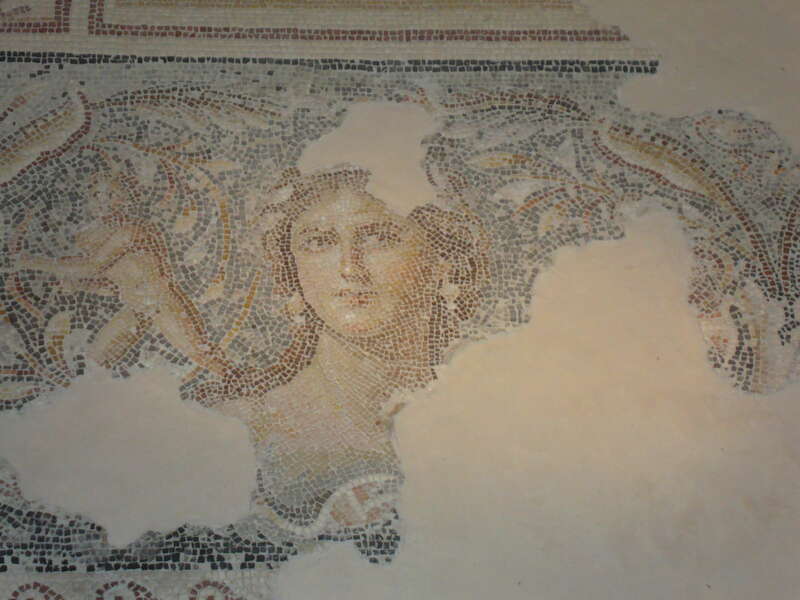 In the remains of a house we saw what is considered to be the most beautiful execution of a woman’s face ever found on a mosaic; the “Mona Lisa of Sepphoris” blushes as her eyes follow us round the room. It would be hard to believe that Jesus would not, at some time, have taken the one hour walk from His home town of Nazareth to the capital city; perhaps even to work there. 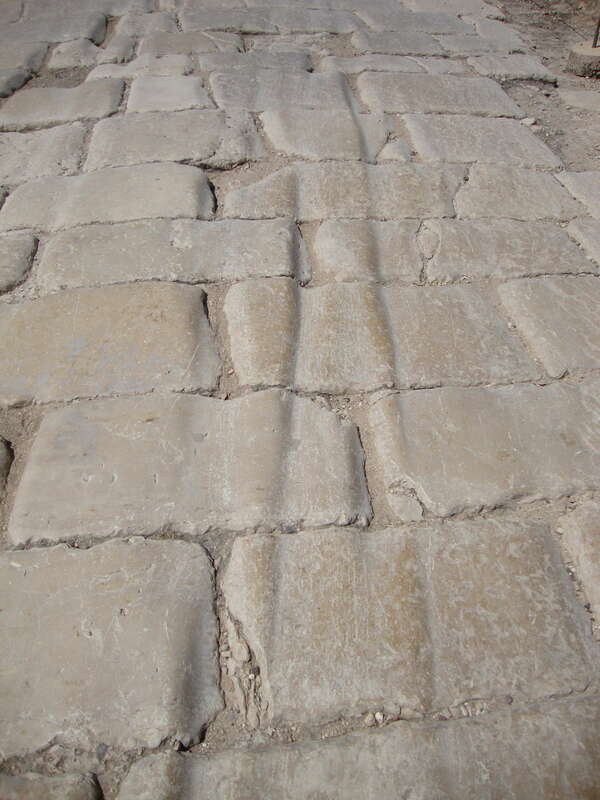 (Because of the rebuilding, tradesmen were in great demand in Sepphoris and both Jesus and Joseph were carpenters). I found the probability of Jesus having visited or worked in Sepphoris intriguing and I couldn’t summarily dismiss it.